The time of year for Comic-Con International is upon us, and once again, I’ve spent many many hours looking up info, back and forth emails, and many unanswered emails. This year, as every year since 1970, all walks of life andawesomeness swarm the city of San Diego for the largest convention of it’s kind. That being of the strange kind. It is physically impossible to attend everything at the Con, however with a well mapped itinerary and lengthy list of what’s releasing, it can make or break your SDCC adventure. This year, there is once again enough events going on to do your head in. Now to the goods. All info and times are subject to change. Stay tuned for more updates as they happen. We try very hard to get a complete list but do understand this is VERY time consuming and most info isn’t out there or we get too stressed out. I also gave up updating this last Thursday. -6-8:00pm To kick things off KR has Frank Kozik signing his new Marvel Labbits for all the true believers out there. Will you go Venom or Wolverine? -noon-1:30pm SDCC EXCLUSIVE RELEASE AND SIGNING of Mecha Zangief Signing by Yoshinori Ono- Legendary Capcom Producer. -The Red Cyclone goes heavy metal. Zangief has transformed to a 3-inch cyber colored vinyl figure. Even super powers can’t knock down this Russian wrestler. -10:00am SDCC EXCLUSIVE RELEASE- Futurama Zoidberg By Matt GroeningThere’s a doctor in the house. Complete with stethoscope accessory, the Kidrobot-ized 6-inch vinyl Futurama Zoidberg will listen to your intestines. If you lose him, look in the nearest dumpster. Super ink squirting Decapodians rule. -10:00am SDCC EXCLUSIVE RELEASE – The Simpson’s Zombie Bart By Matt GroeningEat my brains!Spoon for brains included. Bart looks sick (and undead) in a special one of a kind 6-inch vinyl. -Noon The Circus Posterus crew release custom crumbeaters and bubbleguts by Chris Ryniak, custom Greeter/Midi/Boo skelves by Kathie Olivas and Brandt Peters, Mortimer the Mortician by Brandt Peters, Bumbles and one off Dust Bunnies by Amanda Louise Spayd, custom Ash by Kathie Olivas, drawings/sketches/more, and the debut exclusive release of blank versions of the Wandering Misfits Mini series by Kathie and Brandt. -Shub Zeroth by Metacrypt and Brian Ewing has two versions to choose from, a Black rub ‘Glack’ vinyl for $100 and a Unpainted Slime Vinyl for $80. -The Super Sucklord does it again with “Best Buddies” who are members of the “Gay Empire” series! This two-pack of Suckpeg figures will retail for $75 for the pair and come on a Suckadelic designed pink backing card. Limited to an edition of only 50 copies. -The Super Sucklord has just unleashed some new loving Superheroes! It’s Gay Gotham by Suckadelic. The duo stand side by side in this carded 2-pack of pink power. Edition is limited to 50 and will retail for $125. -1:00pm Mike Egan comes to Comic con for the first time to sign his book, Bones, Lucky, and more. -1-2:00pm Phil Lumbang’s Awesome Bear come sout of hiding and is ready with the man himself to sign it. Only 300 made of this 6.5 inch fella. -3 4:00pm DrilOne and Leecifer sign away at Dragatomi. -5 – 6:00pm J*RYU is there to sign. -11-1:00pm Luke Chueh is there to sign his new Target! Also talk Naruto! -2-3:00pm Luke Chueh releases his “Red Skull” wood print limited to 50 for $75. 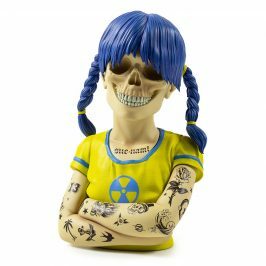 Signings are limited to only SDCC exclusive items, Hi-Fructose books, and items purchased at the Last Gasp tables (Hi-Fructose collected 2 or Junko’s new Pelu book for example). No sketchbooks or vinyl customs please. Exclusives are first come first served, limited per person with no reservations or sales before release. Supplies are limited. See booth for complete details. -1-2:00pm Joe Ledbetter and The Loyal Subjects release the Glow-in-the-Dark GHOST PIRATE BUNNY, with this 10 inch vinyl and limited to 300 pieces. -3:00pm Mark Landwehr & Sven Waschk (Coarse) sign and get asked why they take years to send out their goods. -8-9:00pm Toy Break will be presenting a panel named “Indie Toy Secrets” ! The panel of allstars will feature George Gaspar (October Toys), Scott Tolleson (Stolle Art), H. Eric ‘Cornboy’ Mayse (The Four Horsemen), and Jay Garcia (MANA Studios)! From what we hear there will be goodies for attendies and prizes for Q & A participants. -Munky King throws down again their yearly party. Come see us all make idiots of ourselves! -Noon-2:00pm SDCC EXCLUSIVE RELEASE AND SIGNING- Locodonta Dunny by Jon Paul KaiserDaredevil Dunny never runs out of nerve.This 8-inch vinyl hog is ready to fly. Stunt suit design is topped off with a newly sculpted head including jet streaming ears – and a single engine jetpack accessory. Limited edition of 400. -1:00pm Leecifer signs his Deadbeet and he is just an awesome dude to talk to anyway. -11am-3:00pm Audrey Kawasaki releases her “Keeper” print limited to 200 for $150.Signings are limited to only SDCC exclusive items, Hi-Fructose books, and items purchased at the Last Gasp tables (Hi-Fructose collected 2 or Junko’s new Pelu book for example). No sketchbooks or vinyl customs please. Exclusives are first come first served, limited per person with no reservations or sales before release. Supplies are limited. See booth for complete details. -3-5:00pm Junko Mizuno releases her “Pancakes” Silkscreen Signings are limited to only SDCC exclusive items, Hi-Fructose books, and items purchased at the Last Gasp tables (Hi-Fructose collected 2 or Junko’s new Pelu book for example). No sketchbooks or vinyl customs please. Exclusives are first come first served, limited per person with no reservations or sales before release. Supplies are limited. See booth for complete details. -11:00am Skinner brings his Mansons of the Universe “Charlor” to SDCC. An edition of 50 carded and handpainted vintage figures by Skinner. Each figure is one of a kind and comes with dagger pendant, cape, and hand cast resin head sculpted by the Skin Man himself for $150 each.This will be a timed release at 11am. Followed by a signing with Skinner at 1pm. -2:00pm Scott Wilkowski x Suckadelic have a new treat for you. Scott INFECTED a classic Gay Empire figure for this carded Suckadelic collab. This carded piece $125, and the edition is limited to 50 pieces. -5:oopm Scott Wilkowski and Kozik are ready to sign Infected pieces or labbits for you. Also talk about hockey. -11:00am-Noon SketOne and his Bad Juju brand release an edition of only 100 of the 6-inch tall resin “Dripple”. -Noon-2:00pm SDCC EXCLUSIVE RELEASE AND SIGNING- Keep Watch Labbit. Signing with Frank Kozik and Greg Rivera of Mishka 12-2pm There’s a hell for all things, men and labbits alike! In their underworld Keep Watch Labbits run perpetually from disembodied Hell Hands offering the most unholy petting. Thy horror Labbit! Skinned labbit featuring sculpted brain and muscle tissue, gradient tendons, and GID never blinking eye. Special limited edition of 300 exclusively at SDCC. -Noon Amanda Louise Spayd is signing and sketching in the Circus Posterus takeover of the Cardboard Spaceship booth. -2:00pm Brandt Peters is signing and sketching in the Circus Posterus takeover of the Cardboard Spaceship booth. -4:00pm Chris Ryniak is signing and sketching in the Circus Posterus takeover of the Cardboard Spaceship booth. -2:00pm Nathan Hamill’s “Strife & Sire” has a new version perfect for SDCC with “Super Soldier Edition”. Limited to 50 pieces for $50. Natahn will be signing on Saturday too. -Noon Scott Wilkowski and Andrew Bell are ready to sign are Infected Androids for you. -4:00pm Mike Egan comes to Comic con for the first time to sign his book, Bones, Lucky, and more. -5:00pm the Sucklord is back to sign and make all your dreams come true or sucky. -3-4:30pm Junko Mizuno releases her “Pancakes” Silkscreen Signings are limited to only SDCC exclusive items, Hi-Fructose books, and items purchased at the Last Gasp tables (Hi-Fructose collected 2 or Junko’s new Pelu book for example). No sketchbooks or vinyl customs please. Exclusives are first come first served, limited per person with no reservations or sales before release. Supplies are limited. See booth for complete details. -Time TBA Jesse Hernandez releases his DEATH SERPENT SOUTHERN Edition! Coming in at 9 inches tall, this guy comes with a shield and a spear, Limited to only 90pcs and is priced at $110.00. -11-Noon Kirk Hammett from Metallica is there!!!! -Anna Chambers “turd” handmade plush! -5-color mini skelevex collaboration with Dan DMS and Chris Dobson that will be available at SDCC. -Go say hello to Lauren and Patrick because both are super nice, and Lauren also loves sharks. -Touma brings a small army of ultra limited new colorways of Zoppy, Zoopy Dog and Mao Cat to Toy Tokyo. 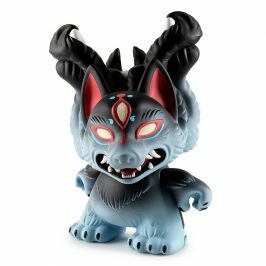 -Mishka and L’amour Supreme have a SDCC exclusive Gangrene edition of their “Keep Watch” figure with Blackbook Toy. 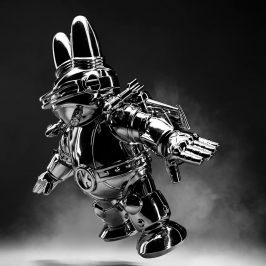 -Each artist has designed 3 dunnys and 3 androids. And you will have your option to purchase either a custom blind boxed dunny or a custom blind boxed android or both! -For the first FIVE people each day (Wed-Sat) to purchase one dunny and one android blind box, they will receive a FREE Referee figure (Sculpted and casted by Jay222) Limit one Free figure per person. -Jon M. of Rampage might have a micro edition of Ugly Unicorns cast in glitter purple sofubi with pinkish inserts. -Leecifer’s resin cast “PickleBaby” figures Is now sofubi! Unpainted versions at the con and maybe some painted dudes too. Lee will also have his blind box release of GAMMY. 9 solid blue, 9 transparent blue, rest misc. -DrilOne puts the Drils style to many custom pieces like Paw, Crumbeater, Fattybug, Dunnys, and even a Dok A Bella! These are just a few, he has way over a dozen customs. -Jason Limon will have a ton of customs, collabs, and one offs. These will blow your mind! -RSIN 8″ Dunny, 4 3″ Agent K Dragatomi edition, And a quick Voodoo Whisper. -Jon M. of Rampage Toys has painted a one-off Yamomark “Yamo-Bazooka” . 9.5-inches tall and is cast out of sofubi. $250. -Raaar is a 3-inch tall Glow-in-the-Dark Double-Cast Skeleton from Dynamite Rex. Made of resin wih a smokey transparent body casting over the glow-in-the-dark skeleton inside. Limited to an edition of only 50. -Blamo Toy’s “Daku Daku,” has two faces like a ton of people I know. These 5-inch tall wooden figures will make their debut at San Diego Comic-Con, available from Dragatomi’s for $60. Oh and only 5 will be at SDCC. -An exclusive you will not pay for a year in advance, HOOT and HUSH by COARSE each standing 3.5 inches tall! Each priced at $12.99. -“Darth Pon”and a possible”Ghost” chase edition of this 3.4-inch tall figure designed by Rotobox Vinyl Anatomica. -MINICEL BATMAN from Rotobox Vinyl Anatomica! 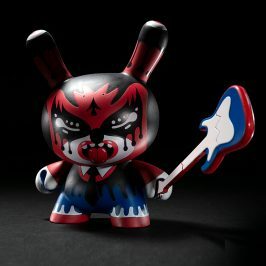 -Scott is releasing three SDCC Deadbeet editions: Frozen Meaty Beet (30 pcs $70) marbled blue/red vinyl, Candy Apple Beet hand-painted by Leecifer (10 pcs, $150) w green/red design on top of a clear base vinyl, and Faker Beet painted by Nebulon 5 (5 pieces, $120) orange, red and navy sprays on a Tiffany blue vinyl base. -Wooper Looper hats in adult and child sizes in a variety of colors. Very limited quantity. Price $20. -Gold Mini 10-Doh! figure releases. 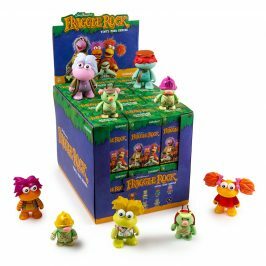 These SDCC exclusive 3.5-inch tall figures will be $20. -Japanese artist Fuei Shokai’s ultra-limited micro edition runs for both his “Kuchisake Onna” (Slit-mouthed Woman) and “Slenderman” 6.5-inch tall figures.San Diego Comic-Con exclusive “DX” versions will cost $75 each. -Robin VanValkenburgh’s “Bernice Beggadear” and “Beatnik Owl Dude,” have been produced in ceramics by VanValkenburgh in signed and numbered 50 piece editions. $50 each. -Time for more “Infected Labbit” by Scott Wilkowski x Frank Kozik! Available in two colors of purple and orange. These will run you $150.Only 75 pieces of each color be made available. -Ron English’s COUNT CALORIE in glow-in-the-dark.It is an edition limited to 100 pieces and priced at $100.00 each. -Mr. Clement introduces the “San Diego Ji Ja” with this colorway limited to 50 pieces, and priced at $45. -“Mys’tea’rious” a Lunartik Special Brew by Matt Jones priced at $22 each and limited to 100 pieces. -GID version of “Crapzombies” by Van Beater. Each pair of Crappy Cat and Flunk Monkey comes with an 11×17 signed, stamped and numbered print. Limited to 100 sets, at $25. -A new member to Super7’s Monster Family line, Josh Herbolsheimer’s “Caveman Dinosaur”! This 4-inch tall figure is textured green sofubi with many colorful sprays polishing off. A limited edition San Diego Comic-Con exclusive and $35 each. -Pocket Sized ROSE VAMPIRE “TANGERINE TERROR” vinyl at 3″ tall and priced at $25 each. -More minis BASEBALL BOY “PADRES TRIBUTE” figure – available in both CLASSIC and MODERN color schemes, both priced at $25 each. -SDCC loves micros and S7 have 1.5″ tall MICRO 2-PACK featuring ROSE VAMPIRE & MUMMY BOY “Blind Bagged” sets, priced at $20 per set. 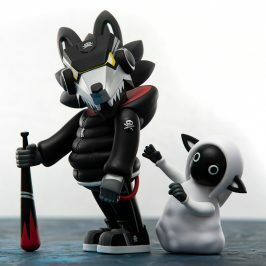 -A big release is the MONOGHOST “UNDERWORLD” figure,which is a 9″ tall vinyl priced at $65. -HONOO “NIGHTFIRE” Leecifer’s burning flame is a fantastic orange vinyl swirled together with Glow-in-the-Dark vinyl. Detailed with brown and dark orange sprays with bright blue eyes! -LEROY C “PINK PASSION” VINYL FIGURE Invisible Creature’s devilish dinosaur is densely packed with silver glitter throughout the translucent pink vinyl. White, blue, and violet sprays highlight the figure! -Alien REaction figures!!! Preorder or get the SDCC prototype two pack, glasses, stands, catalogs and more! -San Diego Comic Con Exclusive, “The Adolescent Hyperactive Ninja Monkey” and these dudes glow-in-the-dark. Standing 5” tall and featuring a removable cloth mask, 2 katana blades, 2 ninja stars, and 1 kusarigama – this resin figure was sculpted by Squid Kids Ink and produced by Mana Studios. Limited to only 45 pieces total at $70 each figure. -Brandi Milne’s “Sugar Lamb, Go!” is another SDCC-Exclusives. Made of vinyl,this piece is approximately 7-inches across, and is limited to 200 pieces, each priced at $90. -Remix Big Boss Robot” will see a variety of artists interpreting Gitna Robot’s Big Boss Robot. Come see the whos at the GR booth. -The elusive silver Sparkle Yeti Mini Marshall by 64 Colors will be making his appearance at SDCC. Standing 2.125 inches tall and produced in an edition of 750 pieces, this awesome little sparkly yeti will be available for $9 each (sales tax included), limit two per customer per day. -Anyoldion Toys “Ion Men” are Three types of unpainted figures sprayed at “The Fort” in Japan, on black, red and blue vinyl. This will be the only time these colors will be released painted.